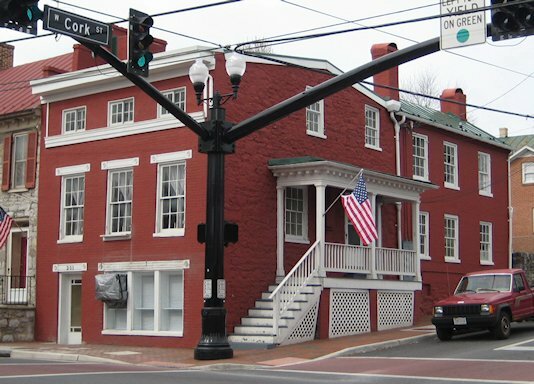 As you saw in part 1, the Samuel Noakes house had been adapted to one commercial space in a sub-first floor area facing Braddock Street and two apartments. In part 2, interior demolition was started to discover what the “bones” of the house looked like under the accumulated changes. As you read last time, the project did not mesh with the historic tax credit process, so all proposed exterior changes needed a Certificate of Appropriateness from the Board of Architectural Review before being applied. In Winchester’s Historic District, historic tax credit projects with an approved part one and two may skip this oversight portion of the BAR. The thinking is that DHR will hold you to the same or higher standards in your project as the local review. Many contractors opt to visit BAR on a voluntary basis for an extra set of eyes and the local perspective on the project. The Samuel Noakes house came before the BAR on May 17 as BAR -12-260. The minutes from the meeting can be read here on Winchester City’s website. Much of what has been seen in the first two parts is reiterated here, but the link is included to give neophytes with the BAR a sense of how a BAR meeting works. In a typical BAR meeting, the applicant or his representative presents the plans for the building’s exterior (interior changes are not under BAR purview, but are sometimes discussed to clarify the reasons for exterior changes, like the egress windows in the Noakes house.) Most of the time, the presentation includes current condition photographs of the exterior, measured drawings, spec sheets for replacement materials, and paint colors submitted to the City’s Planning and Zoning office prior to the meeting. After the applicant has made a verbal presentation, the board members will partake in a question and answer session with the applicant, going over any items that are not clear (like in the Noakes house, they questioned the composition of the shutters and the roof line). If the application is thorough, it is generally approved on the first trip to the BAR with no or minor modification, as we saw with the Noakes house. Stay tuned for the next installment on Friday for part 4.